In our free World of the book exhibition this year, a special display focuses on the history of the struggle for women’s equality – intellectual, political, and physical – in the English-speaking world, from England in the 17th century to the present day in Australia. Over the course of three blogs, we’ll explore this display. Read Part One: Intellectual equality here. The history of women’s political rights, often characterised by the absence of those rights, is a huge topic, and obviously far too complex and culturally contingent to be summarised in one display or one blog. Instead, this display focuses on the campaigns to secure the right to vote for women – first accomplished by New Zealand in 1893 – in the United Kingdom, the United States of America and Australia in the 19th and 20th centuries. 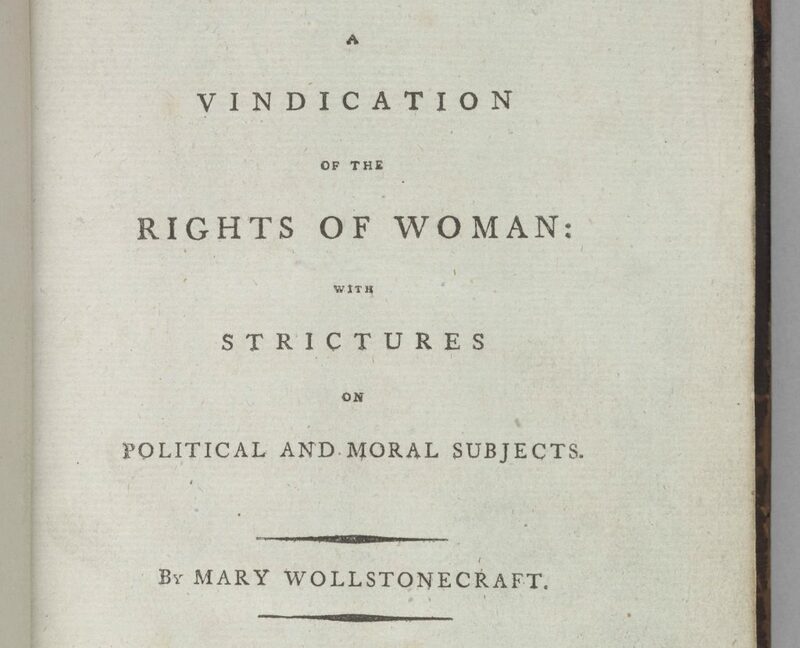 The women leading these campaigns (Susan B Anthony, the Pankhurst dynasty, and Vida Goldstein, to name only a few) drew heavily on Mary Wollstonecraft’s ground-breaking feminist manifesto A vindication of the rights of women. Wollstonecraft (1759–97) survived a childhood damaged by her father’s alcoholism. Like Christine de Pizan and Marty Astell before her, and Virginia Woolf and others after her, she was denied the education given to male relatives. This injustice sparked the flame of a lifelong dedication to fighting for women’s equality. 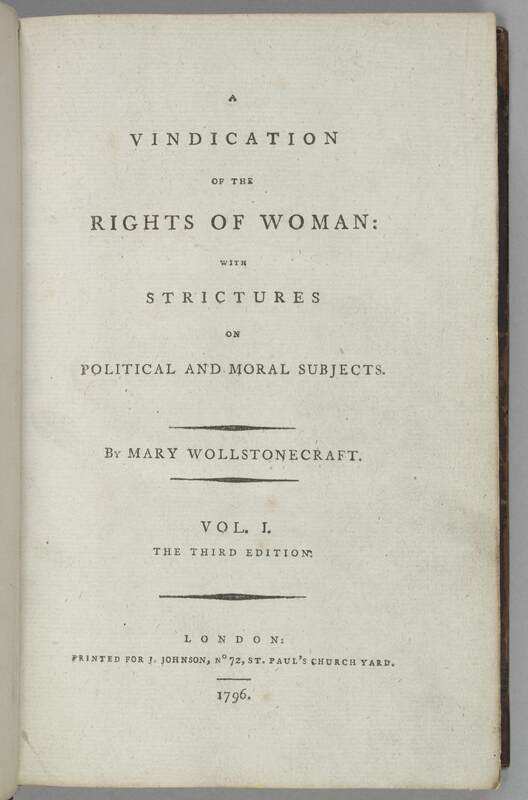 First published in 1792, A vindication of the rights of women argued passionately for social and political reform, shocking even some of Wollstonecraft’s radical friends. One prominent critic called her ‘a hyena in petticoats’, but the book was an immediate bestseller. Despite the book’s early success, during the 19th century, disapproval of Wollstonecraft’s unorthodox personal life – she gave birth out of wedlock, and pursued an unconventional married life with her eventual husband, radical philosopher William Godwin – caused many people who identified as feminists to reject it. Wollstonecraft died after acute haemorrhaging, aged 38, 11 days after giving birth to her daughter Mary. This Mary would go on to marry the poet Percy Bysshe Shelley and to write a pioneering work of Gothic, dystopian fiction: Frankenstein: Or, the modern Prometheus(1818). You can read, watch and hear more about Wollstonecraft’s radical personal and professional life on this dedicated BBC site. Wollstonecraft’s text is now recognised as a key work in European intellectual history. From the 1890s onwards, it was a direct inspiration for the movement for women’s political equality that swept the world, known as the women’s ‘suffrage’ movement from the Latin ‘suffragium’ meaning ‘vote’. This campaign was part of a growing awareness of human rights in this period, including the anti-slavery movement in the United States of America. To Vida Goldstein, Melbourne, Australia. Rejoicing that you have gained the national franchise – and hoping your other states will soon grant the local suffrage – while we of the United States of America struggle on – no one can tell how long – to get the right to vote. Sincerely yours Susan B. Anthony. July 4 1902 – Rochester, N.Y.
Anthony’s hope was well-founded: New South Wales granted women the vote in 1902, Tasmania in 1903, Queensland in 1905 and Victoria in 1908. However, not all Australian women benefited from this reform: the federal electoral system was predicated on the rights of residents in their home states and territories, where Indigenous women (and often men) had few to no rights of any kind. Indigenous women in South Australia gained the vote in 1895 but this was not extended around the continent until the electoral reforms of the Menzies government in 1962. 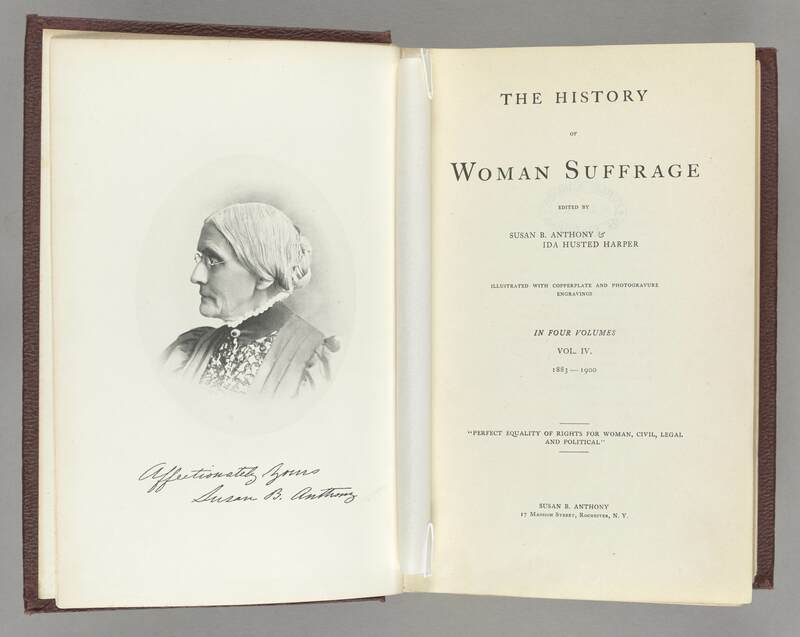 You can explore political ephemera and oral histories about Indigenous women’s suffrage through our collection. The recipient of Anthony’s dedication, Vida Goldstein (1869–1949), contributed significantly to improving human rights in Australia and beyond and is a key figure in our display, linking together the story of women’s rights in the United States of America, England and Australia. Born in Portland, Victoria, she was a vocal campaigner in global movements for women’s rights, pacifism and socialism. After helping Australia achieve women’s suffrage in 1902, she ran for office several times (unsuccessfully), an expression of her passionate, lifelong dedication to improving society. Goldstein’s papers are held as part of the Manuscripts Collection in this library, as is the newspaper she founded and edited, Women Voter (1909–19). 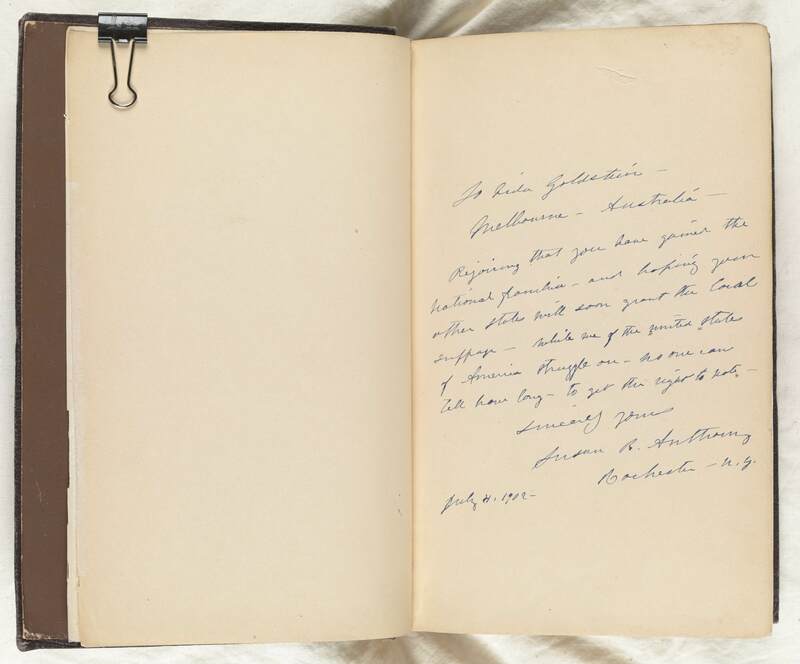 A famous photograph held in this library’s collection shows Goldstein selling Votes for Women, the official paper of Emmeline Pankhurst’s Women’s Social and Political Union. Emmeline Pankurst, with her daughters Sylvia and Christabel, was the driving force of the English suffragette movement. However, another of her daughters is often overlooked in this family narrative: Adela (1885–1961). 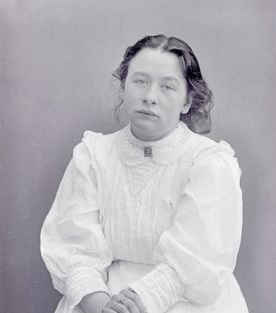 Adela too was a member of the Women’s Social and Political Union, but her embrace of socialism estranged her from her family, and in 1914 she was sent by them to Australia with some warm clothing, £20, and a letter of introduction to Vida Goldstein. Adela never returned to Europe or saw her family again, though they remained in written contact in between periods of estrangement. She joined Goldstein’s Women’s Peace Army (WPA), successfully campaigning against conscription during WWI. You can read the WPA’s manifesto, held in this collection, here. In our World of the book display, we feature Adela’s 1915 pacifist text Put up the sword, published in Melbourne by the WPA. It advocated peace during an intense phase of World War One, and is a great example of the many progressive social causes espoused by campaigner’s for women’s rights: obtaining the right to vote was seen as the beginning of the feminist project, not its culmination. In 1920, Adela co-founded the Australian Communist Party in 1920, but left it in 1923, and by 1941, was immersed in the right-wing nationalist Australia First Movement. Throughout WWII, she wrote supportively about fascist causes, and was interned as a traitor in 1942, to be released after a hunger-strike. Just before her death, she converted to Catholicism. Her complex personal and political life has made her a difficult and often overlooked figure in the history of the women’s movement, absent from both filmic visualisations and written histories that give her mother and sisters starring roles. You can explore her story in depth through her papers, housed with those of her husband and fellow activist Thomas Walsh, kept at the National Library of Australia. Adela’s complex life serves as a reminder to us that the history of women’s equality is always also a history of individuals and of the specific cultural atmosphere of particular eras: it is not a neat line of enlightened progression, and it remains a work in progress. Learn more about Australia’s suffragette movement at the Australian Women’s History Network, including lists of suggested readings, and blog posts by leading and emerging feminist historians. State Library Victoria offers detailed Research Guides on relevant topics around protest movements, including guides specially prepared for VCE students.